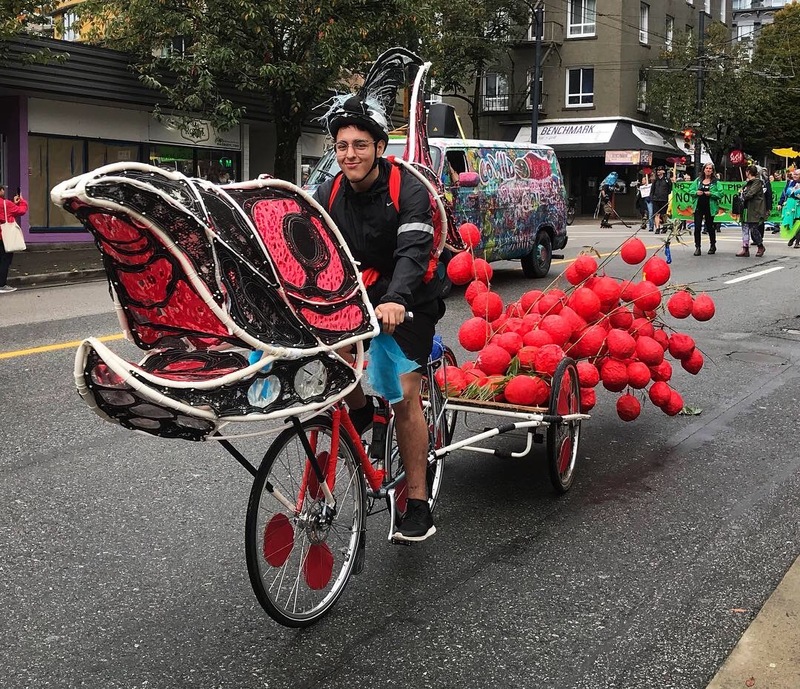 The wild Salmon of the Salish Sea began their journey upstream, swimming through the Vancouver area, and even through downtown Vancouver as part of the Rainbow Parade of the Wild Salmon Caravan on September 22, 2018. While the number of actual salmonids in attendance was low, there were individuals, families, organizations, and communities from all walks of life walking together to support and honour our remaining wild salmon populations. This was the opening event of the Vancouver Sustenance Festival, initiating the celebration of culture and community that will span the next two months. This parade was initiated and organized by members of the Coast and Interior Salish indigenous people. It was just one day of a week-long event that follows the salmon from the ocean in Vancouver, to their spawning locations near Little Shuswap Lake. 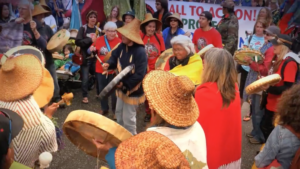 There were bikes outfitted as salmon and their eggs, there were chants and songs from indigenous communities, there were activists and community organizations, and even a feast and a sacred, waterside ceremony to culminate the event. This caravan is a catalyst for the initiatives to respond to the environmental and socio-economic threats to wild salmon while bolstering our recognition and respect for our natural environment and the communities that live within it. While I am a Land and Food Systems student, I am first, a marine biologist and conservationist. I have written papers on the pollutants of fish farms and have conducted research on the effects of urbanization on wild salmon populations. But the science can only go so far without the respect and support of the community to protect our wild salmon. In this aspect, the Wild Salmon Caravan was extremely effective. The parade was open to the public and through its journey through downtown, I witnessed parade members interact with bystanders, and I also witnessed these bystanders walk off the sidewalk into the parade to participate. The parade was welcoming and informative, and made the issue accessible to the public, and also garnered a passion and an interest from many passers-by. The parade minimized negative tones towards industries such as fish farming and oil that could cause detriment to wild salmon populations. By focusing on positive change and inclusion, people in disagreement will not feel marginalized in the discussion but instead feel welcome. Then, we can learn from each other’s perspectives and create open and effective communication networks. While some parade participants utilized shock and controversy in their outfits and floats, such as the mad scientist fish farmers, or the dilbit mermaid, displaying the threats of fish farms and pipelines, the environment remained welcoming and inspiring, promoting positivity and a sense of motivation provided by the community. In a sea of smiles and laughter, there was an underlying determination to act against negative impacts, create lasting change, and preserve a deep respect for our wild salmon population. Further initiatives and events like the Wild Salmon Caravan can create an inclusive environment from which we can progress our society, protect our cultures, bolster our environment, and connect with one another.